Kazakh President Nursultan Nazarbayev announced on March 19 that after 29 years as president, he is resigning. The answer to the ever-present question of Kazakh succession, long on the minds of regional analysts, will soon be at hand. Nazarvbayev’s shocking decision was announced in a televised address to the nation. He said he’d made the “difficult” decision to step down, but did not give a concrete reason for why he was doing so now. The change will take effect Wednesday, according to the Associated Press. As per Kazakhstan’s constitution — and arguably Nazarbayev’s personal choice — the speaker of the senate, Kassym-Jomart Tokayev, will act as head of state until new elections. There were hints that this was coming: In February, Nazarbayev quashed resignation rumors that had been churned up by his asking the country’s Constitutional Council for guidance on what powers he would retain if he were to step down. He also remains head of the country’s Security Council, and will for life given a law passed in May. Nazarbayev said he will also remain head of his party, Nur Otan. “I will serve you until the end of my days,” he said. In late February, Nazarbayev fired the Kazakh government, reshuffling familiar faces around his cabinet. In the coming weeks, there will be a flurry of assessments regarding Nazrabayev’s 30-year tenure ruling Kazakhstan and great focus on the pending presidential election. Nazarbayev was already at the top of Kazakh politics when the Soviet Union collapsed. From 1989, when he named Communist Party leader in the Kazakh Soviet Socialist Republic, until 2019 he’s been at the helm of Kazakhstan. The country, with a population now exceeding 18 million, has made incredible economic gains since the collapse of the Soviet Union in 1991. But the national mantra of putting economic development ahead of political development has left it a democracy in name only — making the next few months a critical time of power transition without a set precedent. In Kazakhstan’s most recent presidential election, in 2015, Nazarbayev ran essentially unopposed and reportedly captured 97.75 percent of the vote. As Nazrabayev, now 78, has aged, regional analysts occasionally speculated about who would succeed him. Tokayev often tops those lists, but we’ll have to see how the impending presidential elections shape up. Given the sorry state of non-pro-Nazarbayev politics in Kazakhstan, the range of options is limited to an elite circle already near the top. 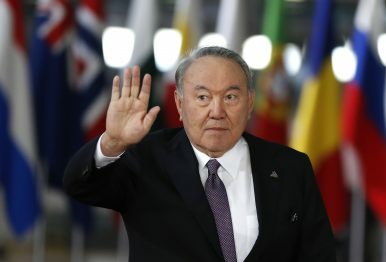 Who Will Run Post-Nazarbayev Kazakhstan?Watch the Throne: Trans-Caspian Pipeline Meets Succession Politics in KazakhstanWhy Is the Kazakh President's 'Cold' Making News?Analyzing Kazakhstan’s First Tenure at the UN Security CouncilIs This the End of the Nazarbayev Era?